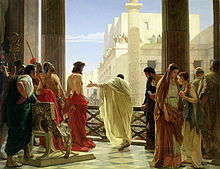 Ecce Homo ("Behold the Man"), Antonio Ciseri's depiction o Pilate presentin a scourged Jesus tae the fowk o Jerusalem. Pontius Pilate (Laitin: Pontius Pīlātus, Greek: Πόντιος Πιλάτος, Pontios Pīlātos) wis the fift prefect o the Roman province o Judaea frae AD 26–36. He served unner Emperor Tiberius, an is best kent today for the trial an crucifixion o Jesus Christ. ↑ 1.0 1.1 "Britannica Online: Pontius Pilate". Britannica.com. Retrieved 21 March 2012. ↑ Jona Lendering. "Judaea". Livius.org. Retrieved 21 March 2012.